Do you support or not support the Abe Cabinet? By rebounding in the 7-8% range, the Abe Cabinet has recouped in a single month almost all the losses in popularity incurred by the precipitous and contentious passage of the Special Secrets Protection Act. That two news organizations at opposite ends of the spectrum as regards criticism of the Abe administration have polls exhibiting exactly the same degree and direction of momentum makes the apparent rebound all the more dependable. The Prime Minister's visit to Yasukuni on December 26 does not seem to have in any way hurt his Cabinet's image. Indeed, the internationally condemned visit likely boosted the Cabinet's numbers among disillusioned hardliners, lifting the Cabinet's overall support numbers. Do you think it was a good thing or not a good thing that Abe paid a visit to Yasukuni? Do you appreciate or not appreciate the Abe visit to Yasukuni? Should the country construct a secular war memorial? Which political party do you support? The image accompanying this post was the final slide of my January 9 presentation at Temple University Japan (TUJ will be posting the full slide show and the video of the session soon). My message to my fellow travelers of the left at the presentation is the same one seemingly being sent out by today's poll results: stop your wishful thinking, reconsider your loathing. 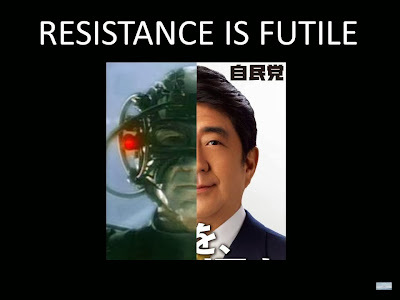 There is only one game in town...and it is Abe Shinzo and his LDP. I get your analysis as to why you believe the Abe regime is secure for some time to come, but I'm less sure what you are asking of "fellow travelers of the left." You write: "stop your wishful thinking, reconsider your loathing. 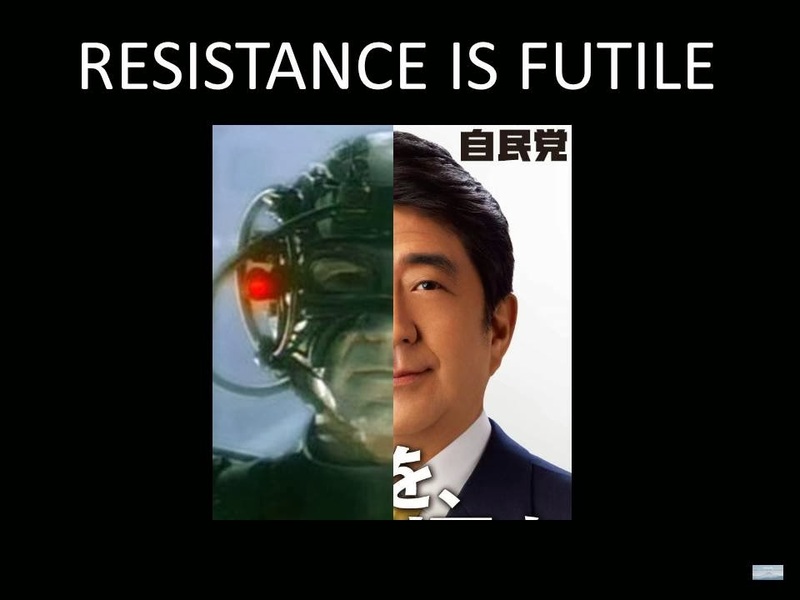 There is only one game in town... and it is Abe Shinzo and his LDP." So what does that mean exactly? Should we now all go out and harass Korean shopkeepers and make daily pilgrimages to Yasukuni Shrine? Why does the fact that Abe is currently popular mean that those on the left should reconsider their loathing? Are we only to loathe and oppose those who are unpopular? If Abe is judged to be correct on an issue, that judgment should be made on the basis that the facts support him. Likewise, if the facts do not support him on some issue, he should be opposed. Popularity or unpopularity need not come into it. Besides, as you well know as an historian, plenty of the worst governments produced by man were popular for some years before they led their people to tragedy. Even if resistance is futile, it's better to resist folly and wickedness than to collaborate with it. The calligrapher Zhao Mengfu (1254-1322) was of the Song imperial line. Yet in 1286 he sought service with the Song's conquerors, the Mongol Yuan, in their new capital Beijing (北京). After an attempt to win high office, Zhao headed back his home in the lakes region. There he met Zhou Mi, the leader of a group of intellectuals dedicated to the preservation of Song culture and rejecting the rule of the Mongols. Knowing that the Zhou family hailed from Jinan in Shandong Province, Zhao painted a scene from the area, a scroll now known as Autumn Colors on the Que and Hua Mountains (http://www.chinaonlinemuseum.com/painting-zhao-mengfu-autumn-colors.php), as a gift. Wickedly, in the inscription Zhao placed Queshan in the east and Huabuzhushan in the west, so that the painting seemed to be a view from the north looking south. In reality, Queshan is west of Huabuzhushan, so that the painting is really the view from the south looking north. The message, which Zhou eventually deciphered (the annals state drily, "The painting did not stay in his collection long...") was that the gaze Zhou and those like him cast toward the south, toward the Song's former capital of Hangzhou, was self-defeating. "Pretend you face south, that there is something there," Zhao says with his painting, "The unavoidable reality is that we are all looking north." Unless there is some hidden irony in that the Yuan dynasty was one of the shorter ones in the past 1,000 years of Chinese history, that story is a very silly response to Michael Penn's sound remarks. I agree that it's futile to expect another party to have an electoral victory soon under the present system -- given how undemocratic the electoral system is. The Diet is like a fox in a henhouse, formulating its own rules, and the Supreme Court is absent, afraid to make a fuss lest the PM start second-guessing the Chief Justice's nominations instead of blandly approving them. But it's less surprising that Abe's opinion polls have bounced back when one recalls that press freedom in Japan is very limited in practice, and that most Japanese are selectively educated about modern history, thanks to the political party that's controlled the educational system for almost all of the past 60 years. And also when one recalls how much more focused Nihonjin are on keeping their jobs, as real incomes have declined and as their chances of joining the precariate have increased in the past decade. In this country it's OK for employers to fire employees who engage in any political activity outside work. The counsel to give up resisting is irresponsible at best. Especially for those of us who are teaching in colleges and universities here (and by "us" I don't just mean gaijin), it's all the more urgent to educate students about the nature of democracy, and about Japan's own history of democratic movements and resistance.